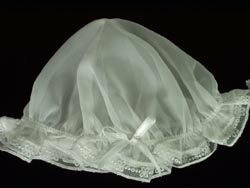 This exquisitely decorated lathopana set contains an oil sheet embellished with rhinestone centered embroidered flowers and little pearls. 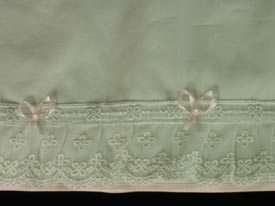 The sheet is trimmed with a sheer lace with pink satin edging and accent satin bows. 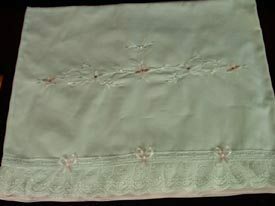 The sheer undergarments are also trimmed with the same fancy lace and satin bows. 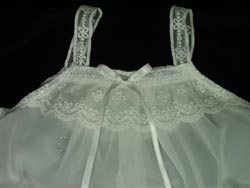 Don�t miss the detail on the elegant sheer camisole top, which includes a special rhinestone heart. 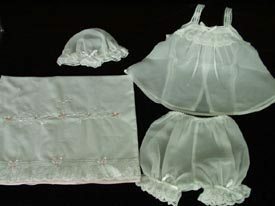 This heirloom quality set will be a special keepsake for any girl�s baptism.